Bolstering the organizational capacity of civil society organizations (CSOs) working with communities on family planning, maternal and child health, and social accountability issues has formed a major part of the Health Finance and Governance (HFG) project’s work in India over the past year. Working with the White Ribbon Alliance of India (WRAI), HFG is supporting a total of 26 CSOs — 15 from the state of Jharkhand and 11 from Rajasthan — that are all part of the WRAI network. HFG recently concluded five-day training workshops for the CSOs from the two states. The Jharkhand workshop was conducted in July in two parts: one held from July 11–12 and the other from July 19–21. The HFG team rigorously deliberated on the lessons and feedback from this workshop to further refine the training content and delivery mechanism. 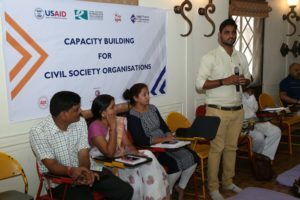 The five-day training workshop for the Rajasthan CSOs was held during September 4–8. The training included knowledge sharing, skill building, and practice sessions on a broad range of organizational development themes. The training program, content, and resources were designed based on the CSOs’ capacity gaps and needs, which had been ascertained earlier through an organizational capacity assessment exercise. The training content as well as the resource kit material was bilingual, produced and delivered in both English and Hindi. Senior functionaries from each CSO, including its program head, chairperson/secretary, and finance department head, attended the training. The total number of training participants from the two states stood at 81 — 45 from Jharkhand and 36 from Rajasthan. The major areas covered by the training included leadership, financial management, human resource management, strategic planning, fundraising, and communications. The interactive training format involved regular group practice sessions, which allowed participants to share their experiences and discuss how lessons learned from the training could be applied at their organizations. The training workshop ended with each participating CSO formulating an action plan on the corrective activities it planned to implement in the short term. The potential on-the-ground impact of HFG’s capacity building support is huge, given the large reach of many of the supported CSOs; for example, Ekjut, one of the participating CSOs from Jharkhand, has a pan-state reach, covering a population of about 33 million. 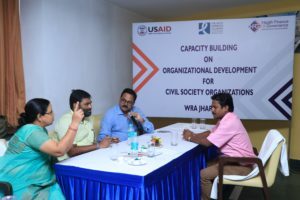 HFG India interviewed Sanjay Kumar Paul, the Jharkhand state head for WRAI, to discuss the role of CSOs, their challenges, and the likely impact of HFG’s capacity building support. HFG India interviewed Abha, Program Manager – Gram Jyoti, a CSO based in Deoghar district of Jharkhand state, to discuss the value of CSOs and how the capacity building support can contribute to efficiency and sustainability of these organizations. HFG India interviewed Jyoti Choudhary, Program Manager of Shikshit Rojgar Kendra Prabandhak, to discuss the value of CSOs and its role in improving the health outcomes through maternal / child health services and family planning. HFG India interviewed Smita Baipai, State Head of the White Ribbon Alliance Rajasthan, to discuss the value of CSOs and its role in enhancing the uptake of health services and improving voice of women and other marginalized groups. HFG India interviewed Ranveer Singh, Deputy Director of Jatan Sansthan to discuss the value of CSOs and and his experience with HFG support in capacity building.